Berlin's nature and greenspace conservation is widely recognised. An estimate in 2000 found nearly 20% of its total space in protected woodland, and less than 50% of total space developed. Berlin exhibits a range of practices that boost biodiversity, such as varied habitats, human introduction of species, and dispersion of species from large-scale protected areas. Berlin's highly praised planning practices for urban nature include the Biotope Area Factor and the Compensation Measure. Berlin's greater metropolitan area has a high number of European Union Natura 2000 sites – some 15+ – covering 7% of its total area. This is part of a much larger network of protected natural areas around Berlin. A city’s ecological footprint can be reduced via protecting greenspaces and biodiversity, thanks to reducing sprawl and limiting the expansion of road networks, and promoting higher urban densities. 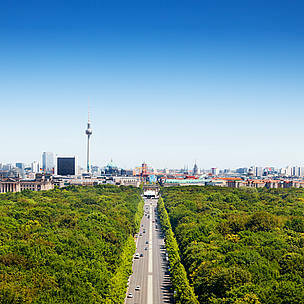 Berlin is cited as an example of how urbanisation can actually increase species richness, specifically at moderate levels of intensity (see also Emscher Park). 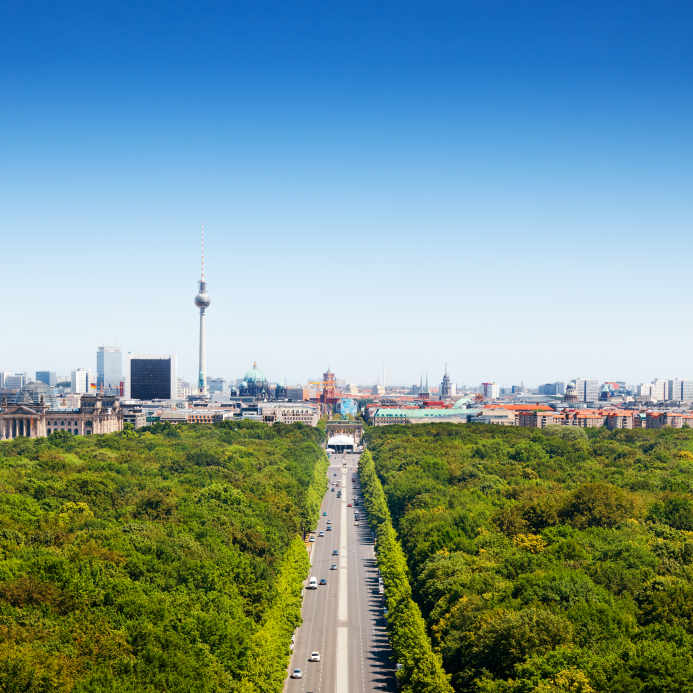 One study on Berlin found the highest variety of habitat types and plant species in the transition zone between the urban core and the periphery. The key is, surprisingly, that moderate levels or urbanisation can produce high variety (heterogeneity) of habitat types, according to a theory known as “intermediate disturbance”. The Berlin-Brandenburg Region has both large spatial contrasts, and variation of population density. 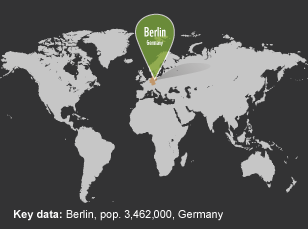 Berlin's core has a population density of 12,000 per sq km, but its suburbs have just 800-1,500 humans per sq km, its periurban area 180 people per sq km, and its outer area 40 people per sq km, or less. This allows multiple habitats to thrive. Biodiversity in city-settings can also be boosted by human introduction of non-native species. For example, the loss of natural habitats for native species can be offset by non-native species able to occupy urbanised habitats. In Berlin, one study found that the proportion of non-native plant species increases greatly from the nature preserves (6%) to the suburbs (25%) to the high-density areas (54%). This is a pattern confirmed for birds, insects, and mammals. However, there can also be heavily negative biodiversity effects of introducing non-native species. The Metropolitan Berlin-Brandenburg Region is widely noted for the high quality of its regional planning. It has 338 Natural Protection Areas (152, 336 ha) covering 5% of the surface area and 112 Landscape Protection Areas (951,337 ha) covering 32% of the surface area. There are altogether 15 Large Protection Areas (9,705km2, 30% of the surface area), with nature parks, national parks, and biosphere reserves (see also Auckland, Stockholm, Stuttgart and Vitoria-Gasteiz). Nature conservation is pursued via three main legal instruments that are part of the Urban Development Plan. These are the Land-use Plan, the Landscape Programme, and the Species Protection Programme. The region's background in Soviet-style planning is cited as one important factor. One leading urban-regional ecologist, Richard T.T. Forman, groups Berlin with Moscow and Bucharest in this category: they all share a pattern where a regional ring around the urban core is overwhelmingly made up of large fields and wooded areas (often for military use and large-scale agriculture). Historical factors specific to Berlin that are cited by other researchers include the concept of “people parks” dating to the 1870s, urban planning that prioritised open green areas from 1910 onwards, and the Cold War period when Berliners could not easily travel and so needed recreation areas nearby. Suburbanisation and urban sprawl after Germany's reunification are also observed, however. Still, given the historical background, Berlin-Brandenburg may be a good example of greenspaces that are more likely to persist. This is because, Forman argues, they “clearly fit into a larger context, which is widely understood by government and the public”. The Biotope Area Factor (BAF / Biotop Flächenfaktor BFF) is the proportion of green space that new development in Berlin must have. Its effect is to preserve greenspace even in dense urban areas. It is flexible, allowing each development to choose among green space measures freely, so long as the required ratio of greenspace to total space is met. Green areas can be of many different types, but are counted in the BAF according to a weighting system based on: evapotranspiration quality, permeability, rain-water storage capacity, connection to soil functioning, and provision of habitat. For example, a surface is counted 100% if it has vegetation connected to the soil below and supports flora and fauna. But vertical greenery (e.g. on walls) up to 10m in height is counted at 50%. The BAF must be followed where there are binding Landscape Plans (circa 16% of Berlin), although it is more widely used on a voluntary basis due to support for the measure. The Compensation Measure (Ausgleichmassnahmen) works to compensate for green areas lost in urban development. It is legally binding, built into nature conservation legislation and building permits. In each case, the most appropriate compensation is found from the existing inventory of all areas in Berlin, prioritising where there is a lack of greenspace. After compensation, there is a legal obligation to check its effectiveness. Some examples are the Falkenberger Krugwiesen extension of semi-natural grasslands around a lake in compensation for a highway, and the Mauerpark in compensation for the high-speed Berlin-Hanover rail link. Aerial view over Berlin Skyline with TV Tower,Reichstag, Brandenburg Gate.